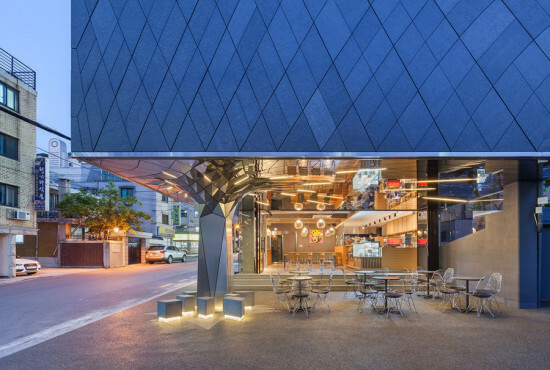 By combining contemporary material processes with organic principles, DaeWha Kang Design has transformed a 1980’s-era office building into a new dynamic headquarters for Communique, a public relations firm in Seoul Korea. With a very limited budget, the project team focused on four key points throughout the design process: the production of a human-oriented design, an environmentally responsive facade, a collaborative working environment, and evaluation of design through simulation and measurement. The renovation scope includes retrofitting a ground level parking area into an indoor/outdoor café, re-programming of the office area to maximize daylight for employee desk locations, and a rooftop terrace inspired by traditional Korean hoerang, or circumambulatory walkways.